Unable to connect to the server database located in a LAN. 1. Add AnyLexic.exe to the trusted (safe) programs list of you firewall or antivirus software on the computer where AnyLexic is installed. 2. Add AnyLexicServerAdministrator.exe and fbserver.exe to the trusted (safe) programs list of you firewall or antivirus software on the machine where AnyLexic Server is installed. 3. Make sure that Port #3050 is open on computers with AnyLexic and AnyLexic Server. If the problem persists, try connecting to the server database by entering the external IP-address or host name of the machine where AnyLexic Server is installed. 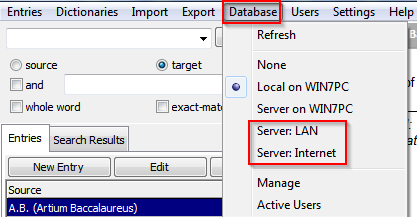 You can also use the Database => Server: Internet menu if AnyLexic is unable to browse the LAN.